The guy behind the Early Retirement Now (ERN) blog is known as Big Ern, but his real name is Karsten. He is big, though, at 6ft 6in, and I’ll refer to him as ERN to keep things simple. 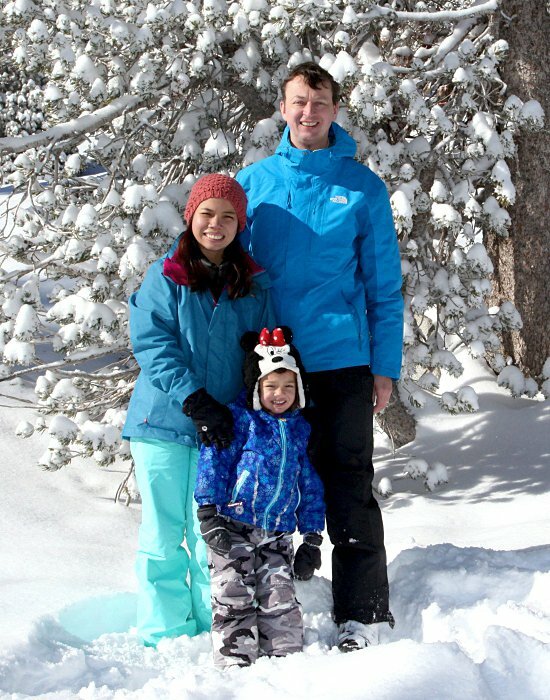 He’s from Germany, though he’s lived in the US for more than 20 years. I first became aware of ERN last year, when I was part of a chain of bloggers describing their Drawdown Strategies. ERN was also part of the chain. 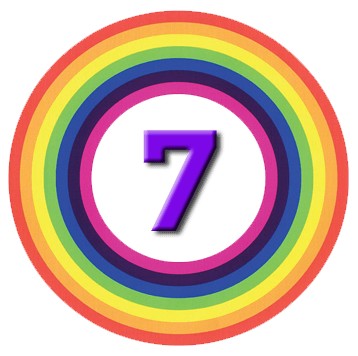 I noticed that ERN had a long series of articles on Safe Withdrawal Rates (SWRs) – it currently stands at 25 posts, which is a lot even for a blogger like me, who is prone to series. SWRs are not covered too much here in the UK, though Abraham Okusanya at FinalytiQ is the notable exception. I resolved to read through the series and then did nothing for a year, during which time ERN added several more posts. As always, I recommend that you read the original articles, but if you are pushed for time, I will cover the key points in what I hope will be far fewer posts. I remembered that it was on my to-do list when I attended the excellent Science of Retirement Conference (SORC, run by Abraham) earlier this year. I’ve already published three posts about the conference (1, 2 and 3), two of which were about drawdown strategies. The fourth and final post from SORC will look at Abraham’s research on drawdown and SWRs. But first, let’s see what ERN has to say. The starting point for the ERN series was a desire to update the work of the Trinity Study (from where we get the 4% rule) in order to make it more relevant to the FIRE community (early retirees, in their 30s or 40s). I quit at the advanced age of 51, so ERN’s objectives are not a great fit for me, but I expect to learn a lot from the way he analyses the problem. Monthly rather than annual analysis. ERN plans to make monthly withdrawals in retirement, but I’ve found that the admin means that I only make a single annual withdrawal myself. When my other half (OH) retires, I guess I can stagger our two withdrawals to be six months apart. And we will have monthly payments from our DB and (eventually) state pensions. Longer withdrawal windows (40, 50 and 60 years as well as the standard 30 years). This makes sense if you plan to retire in your 30s or 40s. Even I will be interested in the 40 year results. DIfferent final value targets – capital depletion / preservation and some steps in between. I don’t have children, so my natural goal would be depletion (final value = zero). But without knowing exactly when you will die (and selling your house in order to rent), that’s a tricky goal. So I will probably target partial depletion (final value = 25% to 50% of starting value). An analysis of the impact of equity valuations (using Shiller CAPE). This makes sense, since stocks are highly valued at the moment, and future returns are likely to be lower than past returns. Reducing withdrawals, to reflect declining consumption and income from DB and state pensions. 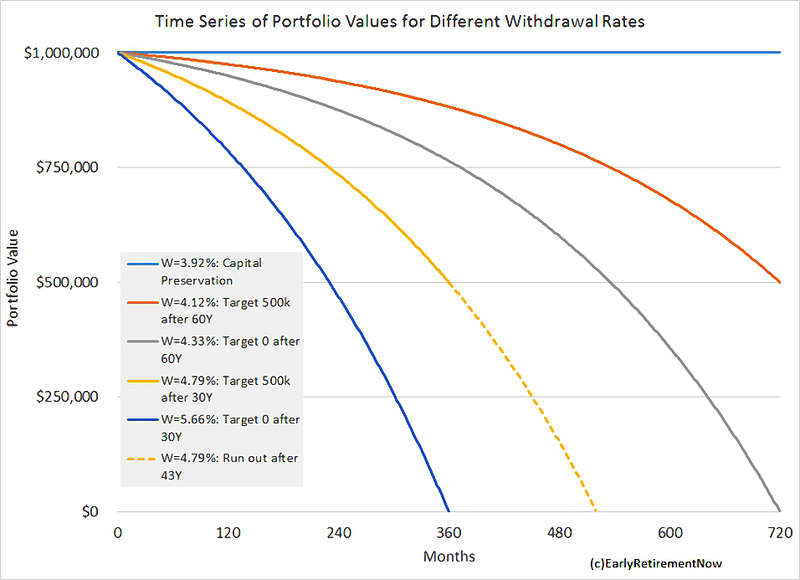 Alternative withdrawal strategies (such as dynamic withdrawals based on equity valuation). ERN used the S&P 500 for stocks and 10-year Treasuries for bonds. He prefers Treasuries to corporate bonds because returns are less correlated to equity returns – a 60/40 portfolio using corporates is really more like a 70/30 portfolio. He used data from 1871 to 2016. Fund costs were assumed to be 0.05%, which seems pretty low to me. 9 withdrawal patterns (flat, slow, low after 20 years, low after 30 years and five others that ERN doesn’t detail at this point). The end product is a set of tables of success rates. It looks like you need at least 50% equities. With a zero final target, you really should be looking for a 100% success rate. For my 40-year horizon, 75% stocks performs the best. 3.5% pa is the highest withdrawal rate that I can be sure of. This is not a bad start for me personally. Nominally, I target an SWR in the 3% to 3.3% range. But in practice, our annual spend is unlikely to be much above 1% of our portfolio. ERN notes that his results broadly agree with the Trinity Study. Longer time horizons have quite a big impact. With longer horizons, 100% stocks does slightly better. 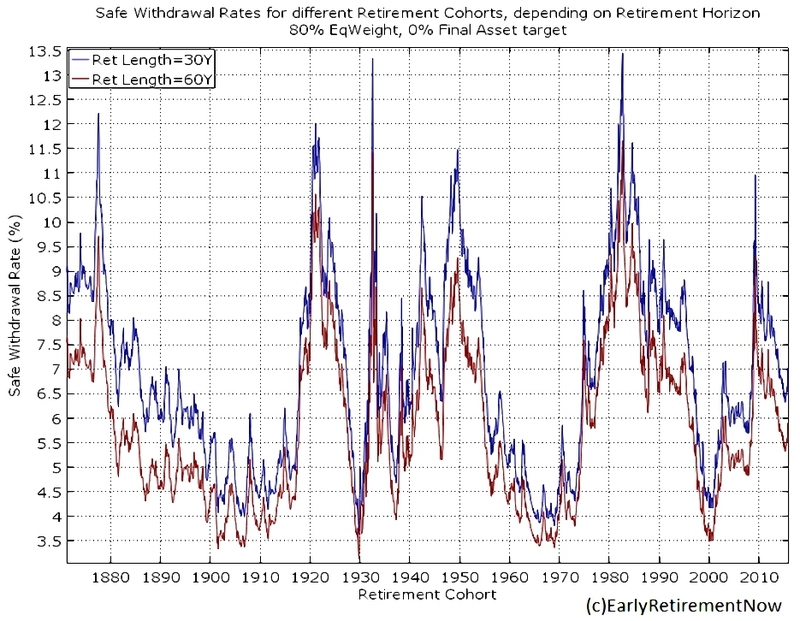 Over 60 years, even with 75% stocks, 3.25% is the highest withdrawal rate showing 100% safety. 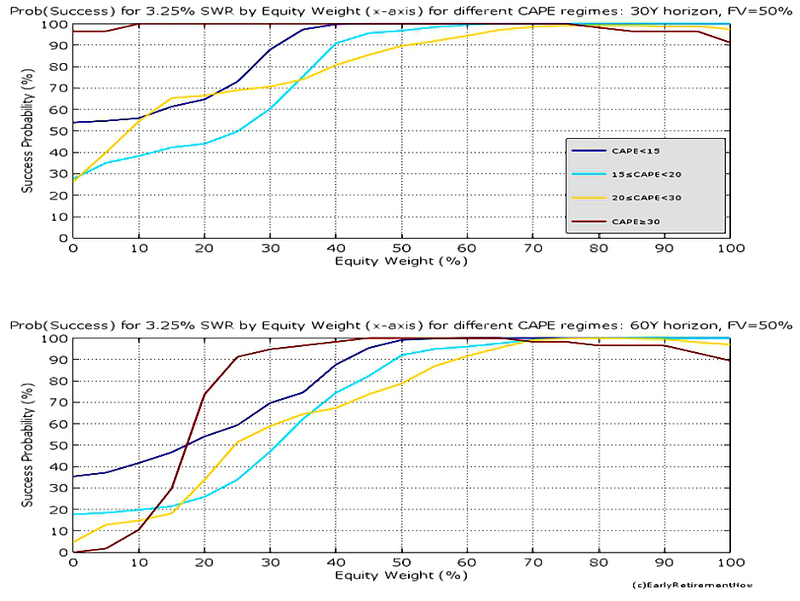 ERN also provides a plot by year (retirement cohort) of the 30-year and 60-year SWRs for an 80% stock portfolio. When stocks are cheap at the start of retirement, SWRs can be well above 10% pa.
That’s it for the first post in the series. Post number two looks at the issue of capital preservation versus depletion. You can’t leave money to your children. Uncertainty means that you might run out of cash a few years too early. ERN warns about extrapolating a 30-year SWR to a 60-year time horizon. The median retiree would be fine, but the unluckiest ones will run out of money. Even with a 100% success rate at 30 years, some won’t have enough money left in the pot to survive another 30 years. ERN also points out that the final pot value is very sensitive to the initial withdrawal rate. Sacrificing half your final pot might only add 0.2% or so to your SWR over 60 years (for the median retiree). It has a bigger impact with a 30-year time horizon. 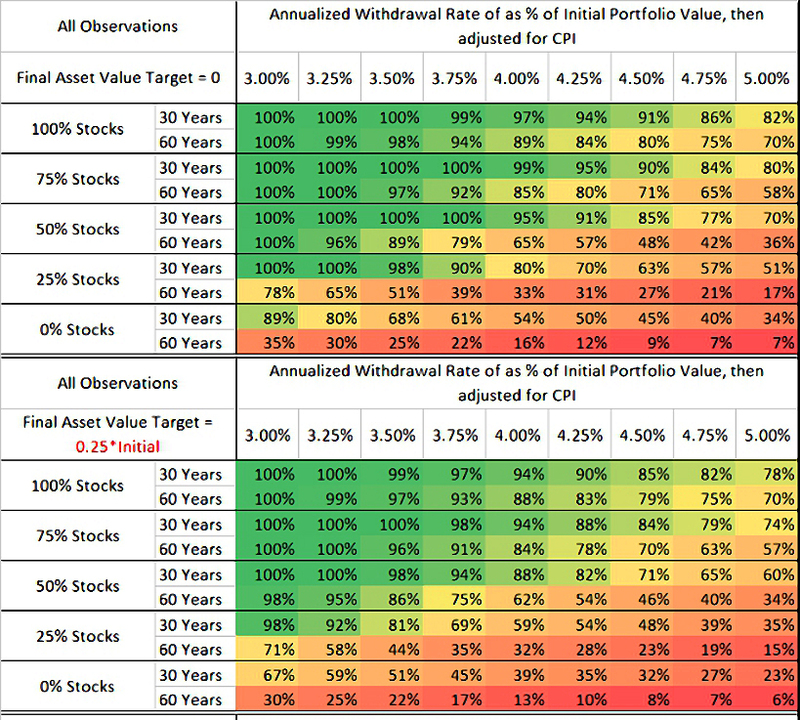 ERN presents five tables showing SWRs for 30- and 60-year time horizons across the five target final values. ERN notes that longer time horizons require higher equity allocations (above 70%). If I target a 50% final pot, I can afford to tolerate a success rate slightly lower than 100% (say 90%). That means that I could push my SWR up to 3.75% pa (interestingly, over either 30 or 60 years). That’s only 0.25% higher (!) than the 100% safe rate for full depletion. For me, that effectively makes the two strategies equivalent. I can either be sure of running down my pot, or have a decent chance of keeping half of it. Either way, I’m in the 3.5% to 3.75% range for my SWR. So I won’t be giving too much consideration to my final pot value. Article number three looks at the impact of equity valuations. ERN is concerned that equities are currently expensive relative to the historical averages, and so future returns might be lower. This would imply lower SWRs than we have seen to date. ERN uses the CAPE ratio to judge how expensive equities are. This measure has a poor short-term predictive record, but a good long-term (10-year) one. The median (US) CAPE is 15, which translates to the long-term real average equity return of 6.6% pa. But the CAPE has ranged from 5 (in depressions) to 40 (in the dot-com boom). That’s quite a variation between the top and bottom group. When ERN did the study (September 2016), the US CAPE was around 26. So expected 10 year returns were around 3% pa real. 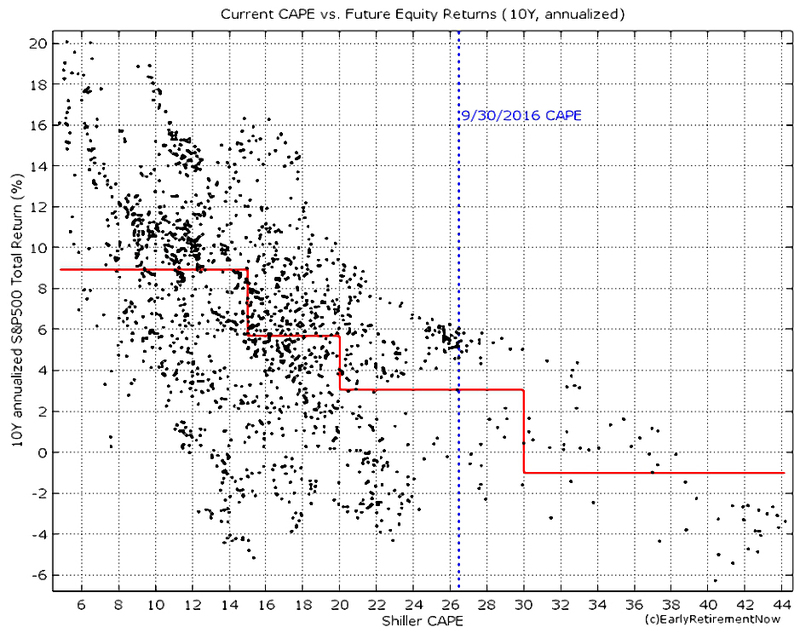 The US CAPE as I write this today is 32.4, suggesting negative real returns for the next decade. 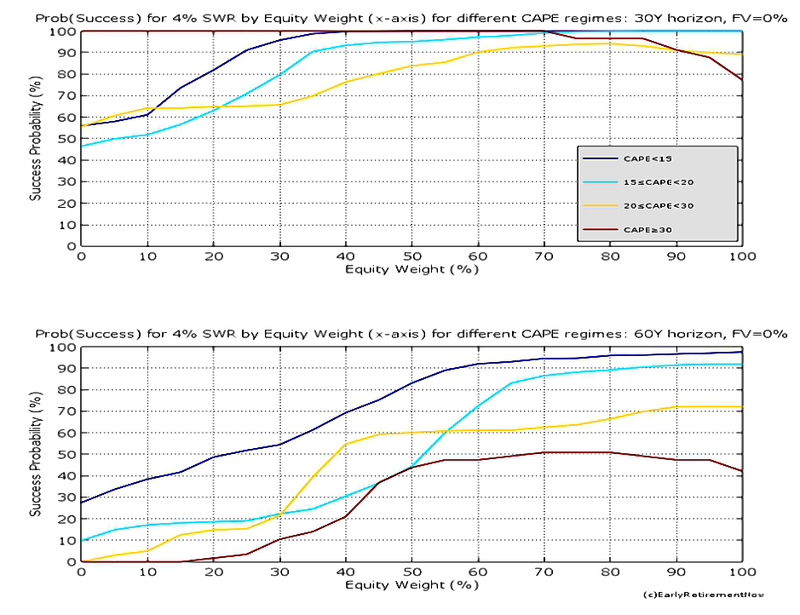 The chart above shows success rates for the classic 4% SWR by equity valuation and proportion. The top half is the 30 year time horizon. Here, you can’t have too much equities when they are cheap. Or too little when they are expensive. The sweet spot is 40% to 70% equities, with 70% the best “all-weather” setting. Things are a bit worse for a 60-year horizon (bottom half). Here you need at least 70% equities to cope with the long time horizon. But success is inversely correlated with starting price. You only get close to 100% success when equities are cheap or slightly expensive. ERN suggests that one way to deal with this would be to vary the equity allocation, using more bonds when stocks are expensive. He (and we) will look at that in a future post. Here’s the same chart with a 50% final value target. The 60-year horizon plot has barely changed. But the 30-year plot has changed dramatically. Now it’s like the 60-year plot. More equities produce better results, unless equities are expensive to begin with. To deal with this, ERN lowers the SWR. 3.5% pa makes a difference, but things start to look much better at 3.25%. That’s the end of the third post in the ERN series, and we’ll leave it there for now. The Trinity Study isn’t much use for people with a retirement that lasts more than 30 years. It also fails people who want to retain some of their starting pot in order to leave a bequest. ERN’s own study produced similar base results to the Trinity Study. 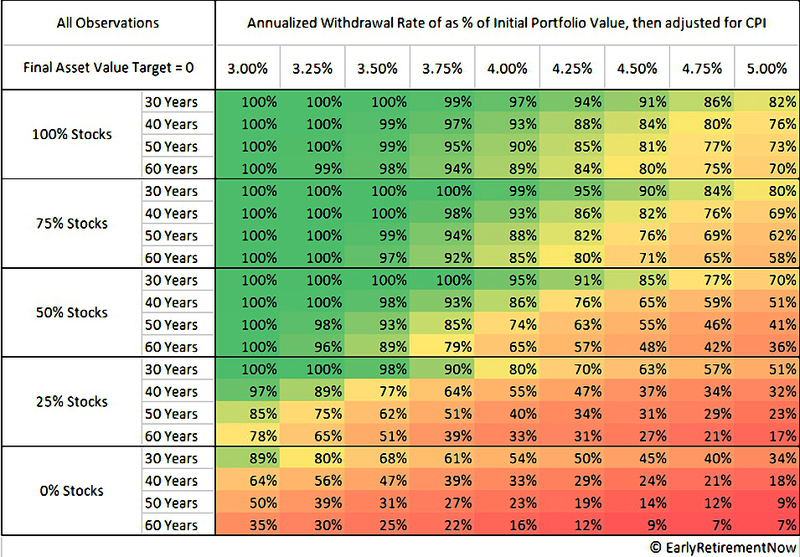 But for 100% success on a 40-year horizon, you need a 3.5% SWR on a 75% equity allocation. The 4% rule can’t be relied upon. Longer time horizons need more stocks (up to 100%). I worry that ERN uses 0.05% for fund costs, but we can compensate for that by simply lowering our SWR to account for higher fees (say 0.3% or 0.4%). Capital preservation (vs. full depletion) has less impact than you might expect, particularly at long time horizons. 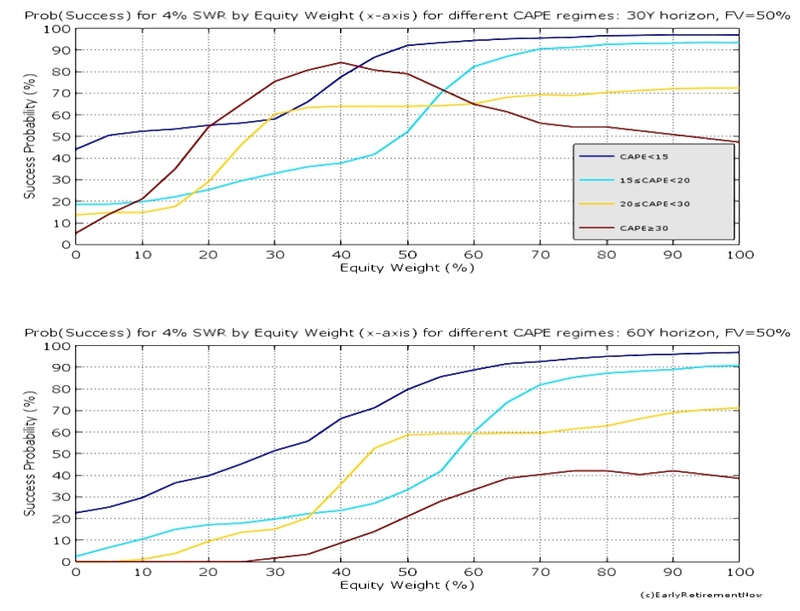 High equity valuations mean lower future returns, which means a lower SWR. 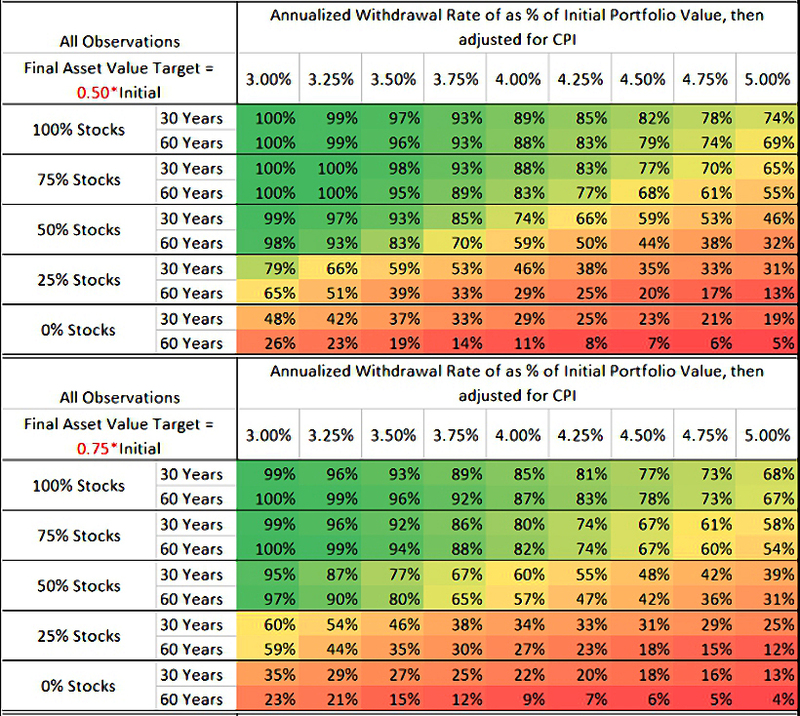 When equities are very expensive, it makes sense to lower your portfolio allocation to them. Bonds are generally not much use with long time horizons, unless equities are very expensive to begin with. 70% equities looks like a good “all-weather” setting. If you have higher annual costs than ERN, you should reduce this percentage further. So perhaps we should rename the heuristic to “the 3% rule”.